As a photographer, this is a site I would love to utilize more often, but in an effort to limit the number of times I use a repeat location and the volumes of other area photographers who come here, I just don't get out to it very often. But whether you are a photographer, bridge lover, or weary traveler, this is a gorgeous little side trip to take. The first bridge across Sugar Creek in this area was built about 1827 by Thomas Black and his neighbors who wanted something better than a ford. That bridge was not a covered bridge and spanned the creek in neighboring Auburn township close to the border with Ball township. In 1880 Thomas Black built this covered bridge. 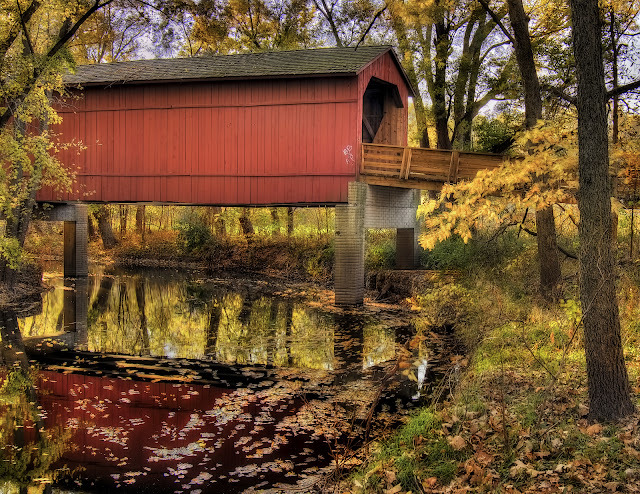 This bridge is known as the Hedley (or Headley) bridge, or the Glenarm bridge, or the Sugar Creek Covered bridge. It was rehabilitated in 1965, but I'm not finding any information on what work that entailed. A local commented that this bridge was still carrying traffic in the late 1970s. According to the NBI, in 1983 a prestressed concrete beam bridge was built just to the south. The bridge was extensively rehabilitated in 1994, raised above the water with poured concrete and reinforced with steel beams. The creek is out of town and surrounded by woodland, but there is a community nearby, and your really not far off the main road. You cannot drive your car across it anymore, but there is a parking and picnic area on the premises. Great any time of year, although I myself am partial to the fall. Definitely a site you should see if coming through the area. Take exit 83 towards Glenarm. Turn left onto Old Rt 66, less than half a mile. Turn Right on second cross st, Frazee rd. The bridge is right off the side of the road, about a quarter mile down.